I got this film for three main reasons: Feroz Khan, Ranjeet and the title. Kashmakash. What a word! It just rolls off the tongue, na? I am informed by my friend Raja—who also subtitled it for me, more on that later—that it means troubles or problems. The people in this have plenty of them, not the least of which is putting up with IS Johar’s endless pompous and pointless pontificating (a problem for us too). Mitigating that, though, are the aforementioned Feroz and Ranjeet; cracktastic Seventies costuming and set decorations; a young plump Rekha (the best kind), a less insufferable than usual Shatrughan Sinha, and Memsaab favorite Rehman; very cool music by Kalyanji Anandji including a fab dance by Padma Khanna; plus an engaging murder mystery. Can a film about a spineless man bullied by his suspicious wife be fun? I admit, I had my doubts. Men complaining about their nagging wives get on my last good nerve. Maybe she’s nagging you because you deserve it! Maybe she was always a nagger and you married her anyway! I don’t have any patience for people (male or female) who claim other people are responsible for their own bad behavior. Khair. I saw this movie long ago in the initial throes of my Helen pyaar and didn’t remember much about it outside of her spectacular song. 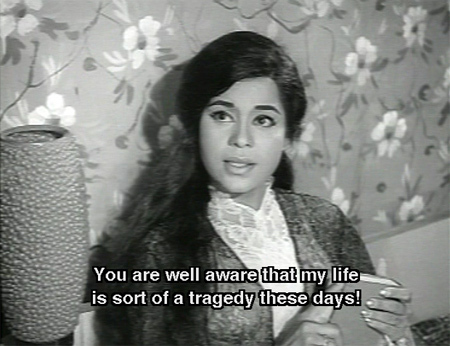 But my developing fondness for Kiran Kumar, who hit my radar with Jangal Mein Mangal—made by the same team with many of the same actors and a movie I thoroughly enjoyed—decided me on a rewatch. Of the seven deadly sins, Gluttony is probably the one to which I am most susceptible (although Sloth is a pretty darn close second). And so, after the delights of Spy In Rome, I found myself signing up for more B-movie punishment—or pleasure!—in the form of Puraskar. I did not expect anything very different from others of its genre, but I was in for a big surprise. 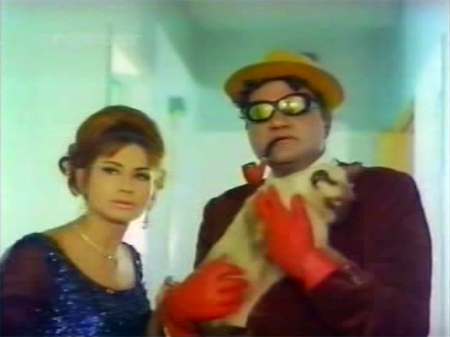 Puraskar may well be the Holy Grail of Indian spy films, a dizzying kaleidoscope of insane costumes, melodrama, blinking Christmas tree lights, and enough characters and plot for three ordinary films. This crazy epic contains every story cliche known to man and then some (this I know even without subtitles), and the scenery of Kashmir—those beautiful mountains and lakes—is chewed up and spit out with a vengeance I have rarely witnessed. Plus we are treated to two fabtastic RD Burman cabaret numbers courtesy of Helen and Faryal (who also have substantial roles). This was an unexpected treat, a breezy comedy starring Kishore Kumar, Kum Kum, IS Johar, Prem Chopra—in a not-villainous role!—and my would-be bahen Laxmi Chhaya. Greedy bad guys, plenty of disguises, goofball antics and a fine sense of the just plain silly are its hallmarks, along with one of my new favorite Laxmi songs. 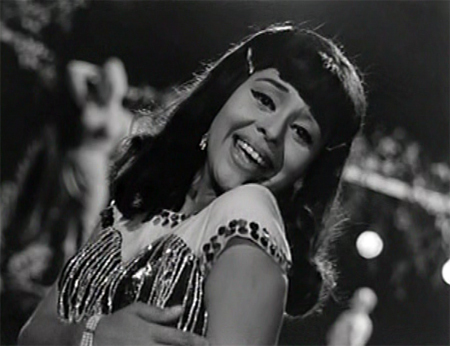 Actually, all the songs by Usha Khanna are fabulous and worth watching. Kum Kum is an excellent dancer too and plays one in this (as well as her long-lost mother) so she has plenty of scope for showing off her talents as well. The storyline is contrived and conveniently glib, but all in all it’s a very fun watch if you feel like shutting off your brain for some simple but satisfying entertainment. About the only thing this dreadful movie has going for it is the Bizarro World subtitles—subtitles so strange but enthusiastic that I pictured a crowd of manic little elves shouting and arguing about the best word or phrase to use, none of which probably made any sense, let alone the one they finally settled upon. 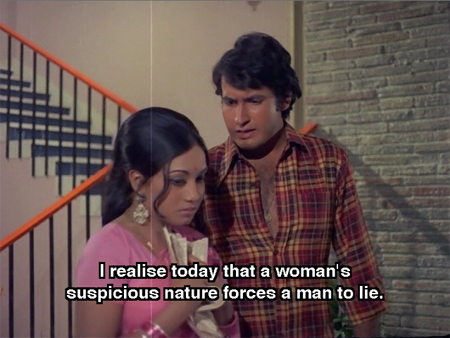 But I thank Bhagwan above for the weird subs, because there was not much else to like. I confess that I have never shared the fervent Rishi love that so many of my fellow Hindi film lovers do, although I do pretty much adore Noughties Rishi who has stolen the show in films like Hum Tum, Luck By Chance and Chintuji. 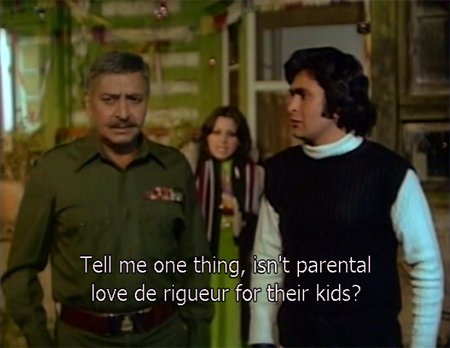 He stars here with his real-life lady love Neetu Singh (whom I DO totally share the appreciation for usually) and my recent acquaintance Zahira, with Pran as his military father figure Major Sharma. The story is an exercise in dysfunctional parenting with lots of overacting (Roopesh Kumar I am looking at YOU) and that sacrificial-lamb theme that I so despise, although at least this time it’s mostly the men who wallow in stupid pointless suffering: equal opportunity martyrdom is the order of the day. 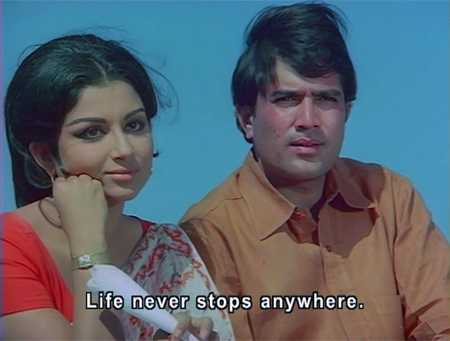 A filmi noir murder mystery starring the lovely Kumkum and the even lovelier (to my eyes) Feroz Khan, with fantastic music by Usha Khanna: how could it possibly go wrong? Well, here’s one way: our hero and heroine are squeezed into the plot around IS Johar, who uses the story as an excuse to don various silly (and occasionally racist) costumes and play the fool. Don’t get me wrong, I love the man—but it is kind of a waste of Feroz and Kum Kum. Also, the script is a total mess. Sorry! No cute Sridevi in this one! 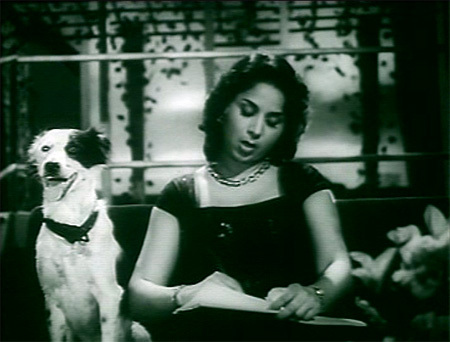 But there is plenty of even cuter Geeta Bali, two dogs, and absolutely wonderful songs by the criminally underrated GS Kohli. It’s written by (and co-stars) IS Johar (who has written such gems as Afsana and Nastik). If it’s considered a B-movie then all I can say is that A has a lot to live up to. It’s a funny, sweet tale of love and social inequality (human and canine) combined with a noirishly silly precursor to the plot of Don (and Shammi’s China Town too)! IS Johar is perfect as the hapless goofball Gullu, and Geeta Bali hilarious as the spoiled England-returned Miss Bambi. 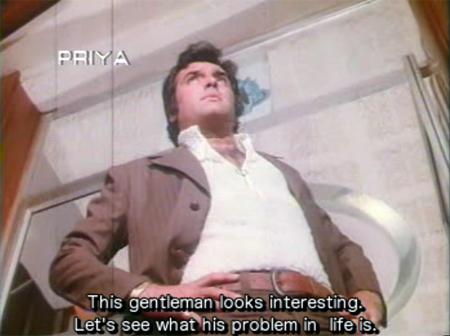 Plus, 21-year old Feroz Khan in what *might* be his first movie ever (?) and Excellent Use of Helen! Oh so unfair! This film beguiled me at the beginning with its humor, pretty songs, and lovely characters, and then sucker-punched me: ka-POW! It turns dark and depressing, full of tragic misunderstandings and a fatal lack of communication. The final message that I got out of it made me want to stick needles in my eyes (there are spoilers towards the end), although I’m pretty sure that’s not what the makers intended.